Bob Haboldt has decided to celebrate the thirtieth anniversary of his career as an art dealer by publishing an anthology of 500 paintings and drawings among the 2000 or so which have passed through his gallery. About twenty authors, experts and art historians have contributed entries accompanying certain works (often in full-page reproductions), while other pieces appear with only a legend and, unfortunately, no historical background. Born in Amsterdam, Bob Haboldt studied in the United States then trained in Holland, at Sotheby Mak van Waay, and Phillips, Son & Neale before joining Christie’s New York in 1979 as an expert on old master paintings, then became president of the Colnaghi gallery. Finally, he set up his own business in New York in 1983, following up with two shops in Paris and Amsterdam. Although the book opens with a 16th century Madonna and Child painted by the Sinnese Master of Monte Oliveto and closes with a 1943 Jackson Pollock composition, the 16th and 17th centuries take center stage, dominated by Flemish and Dutch masters. Among the Flemish, Velvet Brueghel is well represented while Rubens appears with an Annunciation, an oil study for the painting at the Rubenshuis in Antwerp. The various aspects of Dutch painting are well covered here : Jan van Goyen’s landscapes can be found alongside those of Albert Cuyp, Hendrick Avercamps’ winters and Jacob van Ruisdael’s haerlempjes , remarkable notably for a laundering field speckled with light, and a view of Haarlem in the distance, the cloudy sky occupying two-thirds of the composition (ill. 1). From these vast outdoor expanses we transition into church interiors painted by Emmanuel de Witte and Daniel de Blieck, author of a view of the Saint Sulpice church which Bob Haboldt sold to the Musee Carnavalet in 1993. Traditional genre scenes are represented by Adrian van de Venne, Jan Steen and Pieter de Hooch. 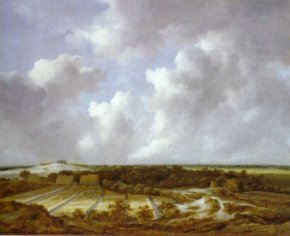 Attributed to Jacob Adriaensz. 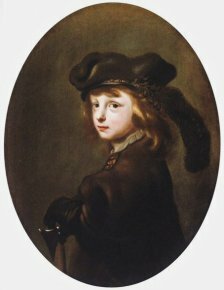 Backer, A Boy with a Cap and Feather and an Axe (ill. 2) is not really a portrait in the strict sense of the word, but rather a "tronie", comparable to the Boy with a Red Coat and Gold Chain from the Royal Museum of Fine Arts in Antwerp. Another, but older, tronie, on view at Maastricht, is Jan Lievens’ Old Man. Rembrandt appears discreetly with a small black chalk drawing representing a man seated with folded hands. A certain number of works have found homes in museums all over the world. Many of these acquisitions have been announced in The Art Tribune and this publication now allows us to evoke others. A Hunting Party Halting by an Ancient Fountain by Esaias van de Velde, circa 1614, was sold to the Toledo Museum of Art in 2008. Dirck Hals is represented with an oil study on paper for a Standing Youth in a Hat which joined the Metropolitan in 2006, while a Young Herdsman Leaning on his Houlette, a drawing by Heerman Saftleven was acquired by the Getty in 2001. Despite a clear Dutch predominance, France, Italy and Germany are also well represented in this publication. The painting Bob Haboldt is most proud of having discovered is thus a Flight into Egypt which he attributes to Adam Elsheimer ; found at a Sotheby’s auction in Monaco, it is now at the Kimbell Art Museum in Fort Worth. Also, the first painting the dealer ever sold is neither Dutch nor Flemish : Domenichino’s The Way to Calvary was acquired by the Getty in 1983. It belonged to the famous art historian Sir John Pope-Henessy and in the 18th century had been part of the Duke of Orleans’ collection. Among the Italians, of special note is also Rutilio Manetti’s Virgin with Child and Saint Michael, the archangel being recognizable due to his suit of armour and especially the scales used to weigh souls (ill. 3). Here, the artist abandoned the Florentine Mannerists, which influenced his first works, for Caravaggio’s manner with a beautiful chiaroscuro effect. 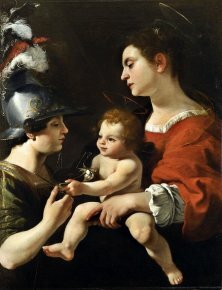 The painting appears to date from the 1620’s, as pointed out by Christina J. Tripi in the entry, and compares it to other figures painted in profile by the artist at that time : Dido and Aeneas (Los Angeles County Museum of Art) ; Lot and his Daughters (Musee des Beaux-Arts of Valence), Saint Jerome Comforted by Two Angels (Banca Monte dei Paschi, Sienna). Besides the still-lifes by Sebastian Stoskopff whose work fascinates Bob Haboldt, the Master of the Hartford Still-life is attributed with Figs in a Tazza Bowl, with Grape Leaves, a Basket of Grapes, Roses and Irises in a Vase, Cherries, Pears, Plums, Peaches and other Fruit on a Table Covered with an Oriental Rug and a Tablecloth, plus as a bonus, two butterflies and a snail (ill. 4). 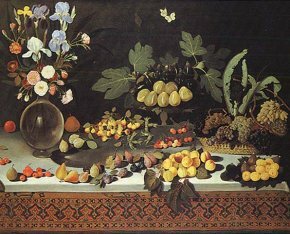 Published in 2002 by Alberto Cottino, this painting is an important addition to the artist’s oeuvre who acquired his name from the Table Laden with Flowers and Fruits, a painting held at the Wadsworth Atheneum in Hartford, Connecticut. His identity is still open to debate - the name of Prospero Orsi (1558-1630) has been suggested as pointed out by Helene Secherre in her entry ; in any case, he obviously followed in the steps of Caravaggio and Cavaliere d’Arpino. We also find here a composition, close to other works attributed to him, divided into three parts corresponding to the vase, the plate and the basket, as well as certain recurring motifs : the fruit placed directly on the white linen, the oriental rug, the detail of the snail, the low perspective. The Italian 18th century is embodied by Tiepolo with an Apollo and Phaethon from 1731 sold to the Los Angeles County Museum of Art in 1986, by Giaquinto and his Diana and Endymion as well as by Ubaldo Gandolfi with a Portrait of a Young Man Wearing a Red Cap. In the forefront of French artist’s names, we find Poussin offering a study for a Rest during the Flight into Egypt, circa 1625, sold to a private collector in 2005, while in 2010 we had admired Charles Poerson’s Saint Sebastian at TEFAF. As for David and Saint John painted by Nicolas Regnier, they definitely share a resemblance. The 18th century of course includes a Boucher, acquired by the Musee des Beaux-Arts in Montreal ; finally, 19th century artists are represented by Fromentin, Thomas Couture and also Eugene Boudin, including a Coastal Scene with Fishing Boats in Normandy, 1823-1857, and its beautiful early morning sky. Collective work, Singular Vision. Haboldt & Co.’s Old Master Paintings and Drawings since 1983, 2012, Haboldt & Co., 430p., 150 euros. Views of Haarlem from afar.